In the seventeenth century the Weald area of Kent gave rise to a simple form of pottery based on the red surface-clay found locally. The pottery became known as Wrotham Pottery. 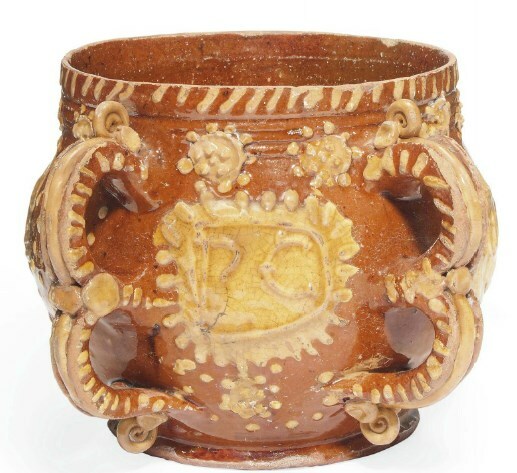 Although centred on the village of Wrotham, similar pottery wares were produced by a number of surrounding villages. The initial primitive nature of the pottery can be based on the lack or resources provided from the landscape. The Weald of the 17th Century was a combination of bare heathland and forests, with little farmland. 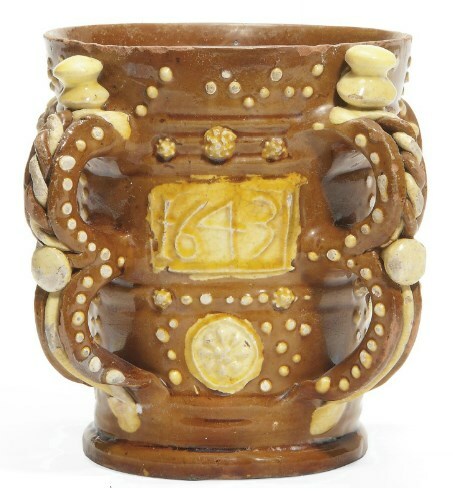 Pictured left: A Wrotham Slipware Initialled and dated TYG 1717 – Of globular form applied with twin double loop handle, sprigged with panels of flowers and fleur-de-lys and prunts, decorated with cream coloured slip on a brown ground, dated 1717, sprigged with a panel initialled PC 5½ in. (14 cm.) high. Sold at Christies for £5,000 ($7,955) on 3rd November 2011. Image Copyright Christies. The pottery was therefore simple and practical. It was not until the appearance of slipware that the pottery started to have decoration added. The growth of decorated housewares meant that there was a move to more ambitious objects and not just utilitarian wares. There is evidence that certain potters made objects to order. 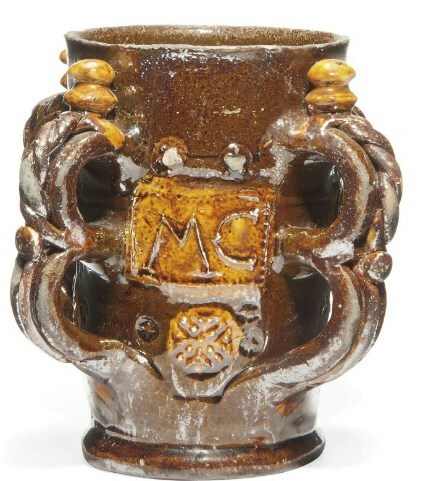 Pictured right: A Wrotham Slipware Initialled Four-Handled Tyg Circa 1630, Initialled Il And Mc, Il Probably For John Livermore – Applied with double loop handles with trailing ropetwists below double bun knops, sprigged with initialled panels and flowerheads in cream on a dark brown ground impressed with scattered star ornament 5 5/8 in. (14.3 cm.) high. Sold at Christies for £6,000 ($9,456) on 3rd November 2011. Image Copyright Christies. The Wrotham Pottery was made by hand or wheel using the local coarse red clay, a lead-glaze was then applied before firing. Decoration was added in the form of lines of dots using slip. This was applied by tube and patterned by the potter. The pale yellow colour of this contrasted with the red and browns of the clay. Pictured left: A Wrotham Slipware Initialled And Dated Four-Handled Tyg 1643, Perhaps Thomas Ifield – Of tapering cylindrical form, with double loop handles, applied with ropetwist and studs, sprigged with cream-coloured slip on pale-brown ground with a rectangular panel dated 1643 sprigged with an oak leaf, fleur-de-lys, goats and a mask among dot-ornament and raspberry prunts 5 5/8 in. (14.3 cm.) high. Sold at Christies for £7,250 ($11,535) on 3rd November 2011. Image Copyright Christies. Many of the potters left their initials on the slipware pads on the pieces. There is little known on the majority of potters but the research that has been carried out suggests strong family ties. Names such as Richardson, Hubble, Livermore and Ifield appear to be some of the most prominent potter families. Most of the surviving Wrotham Pottery pieces are now some 300- 350 years old and due to the fragile nature of the pieces only a hundred or so items are thought to exist. Fine examples can sell for many thousands of pounds.